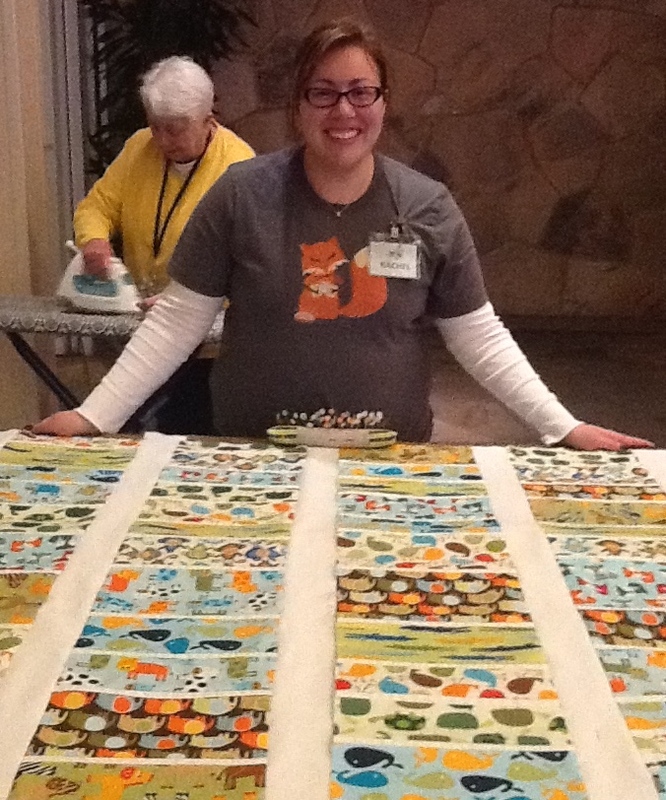 I spent this Friday and Saturday at my annual quilt retreat along with about 25 other dedicated quilters. This is our 6th year at the Illinois State Beach Resort in Zion, IL. Not much swimming going on at this time of year, but it’s pleasurable nonetheless to gaze out on the icy lake as we get our quilting fix. Warning: This is a long post–but it’s mostly pictures. 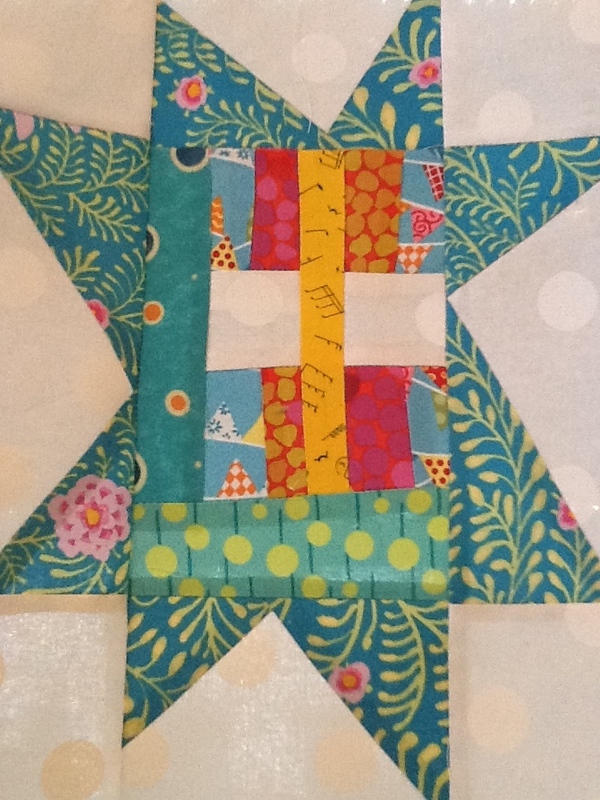 I did a little improvisational piecing this year–no pattern, not much measuring, just fun play with some fabulously colorful materials. Kind of like painting with fabric. 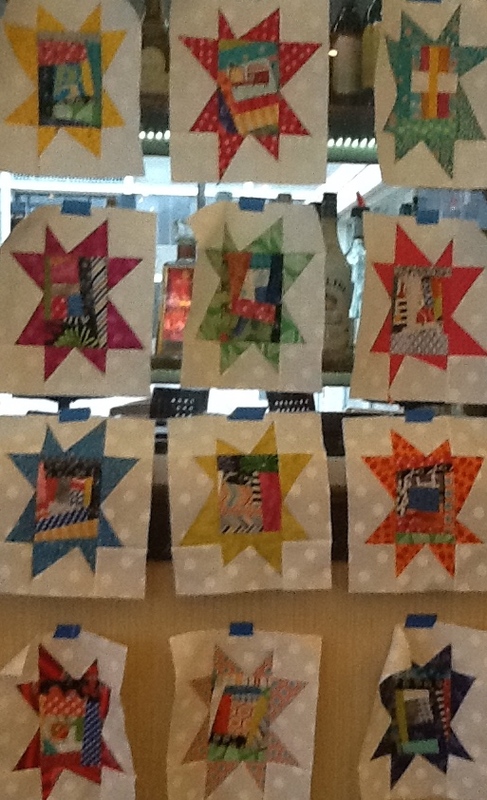 These are a couple of the wonky star blocks I made. 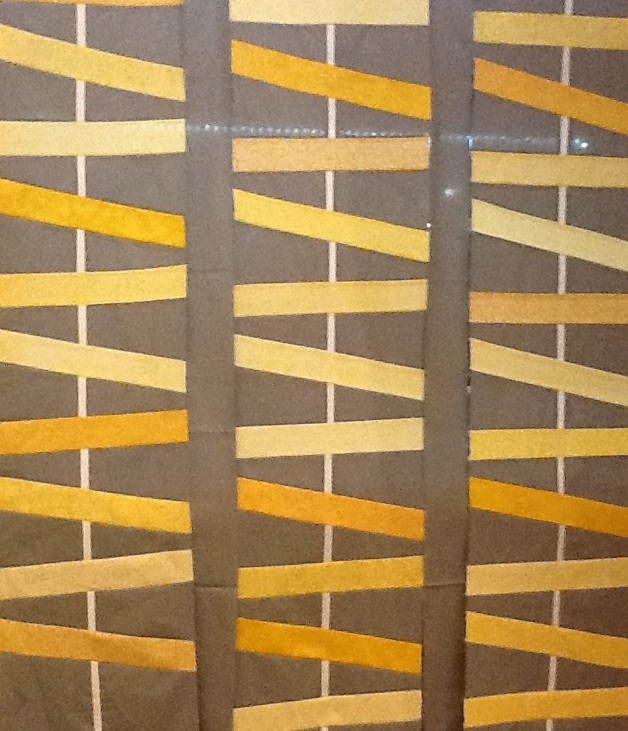 Can you count how many different fabrics are in this one? Many others were more prolific than I. A lot of other fabulous work got done. 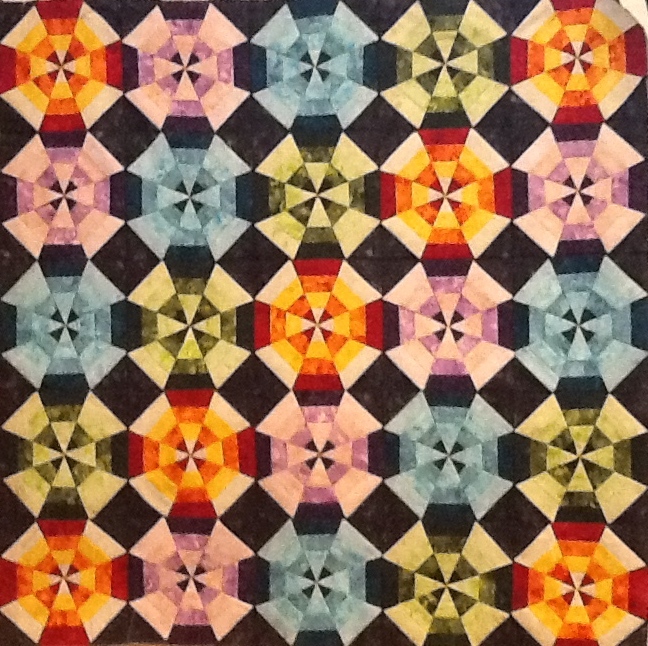 Such happy colors in this finished quilt top. 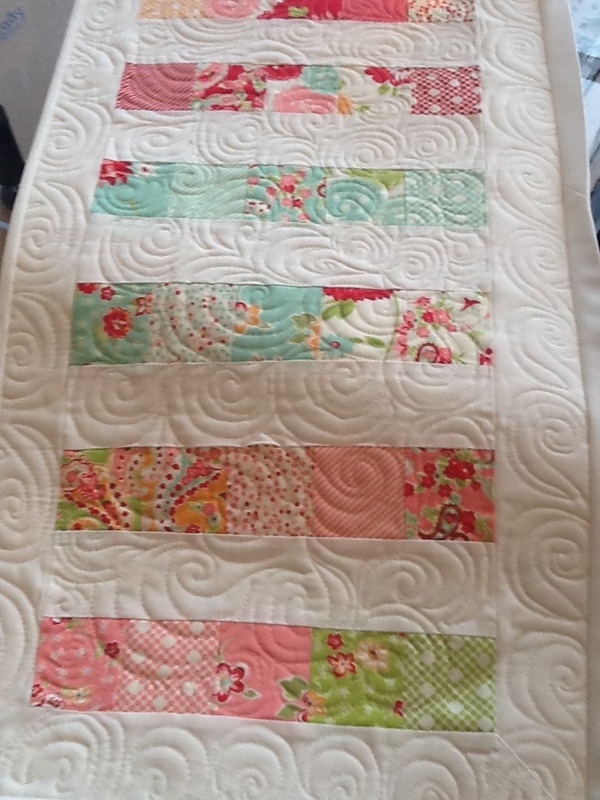 Love this romantic table runner. 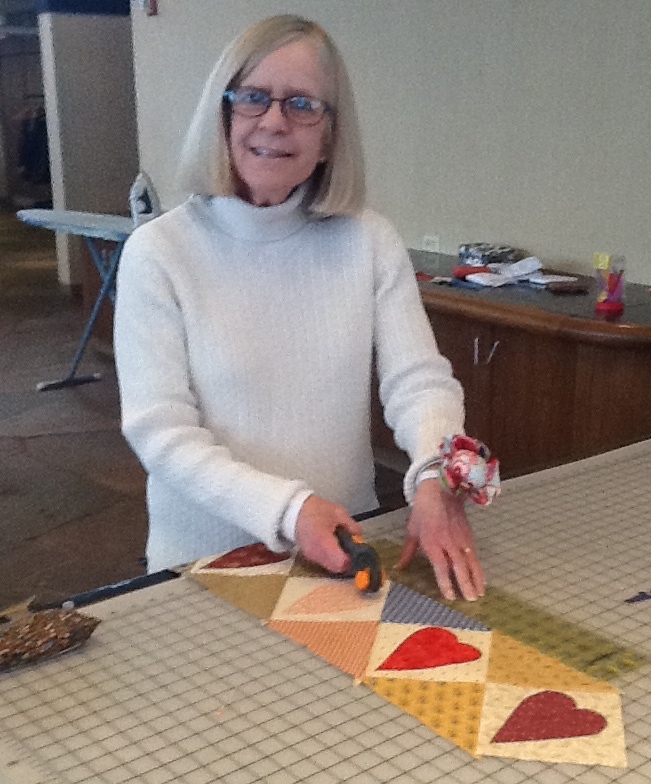 Cheryl works on an art quilt. Can you see the Chicago skyline? Hanging the pieces up on the wall helps with color placement. Love these hand appliqued hearts. 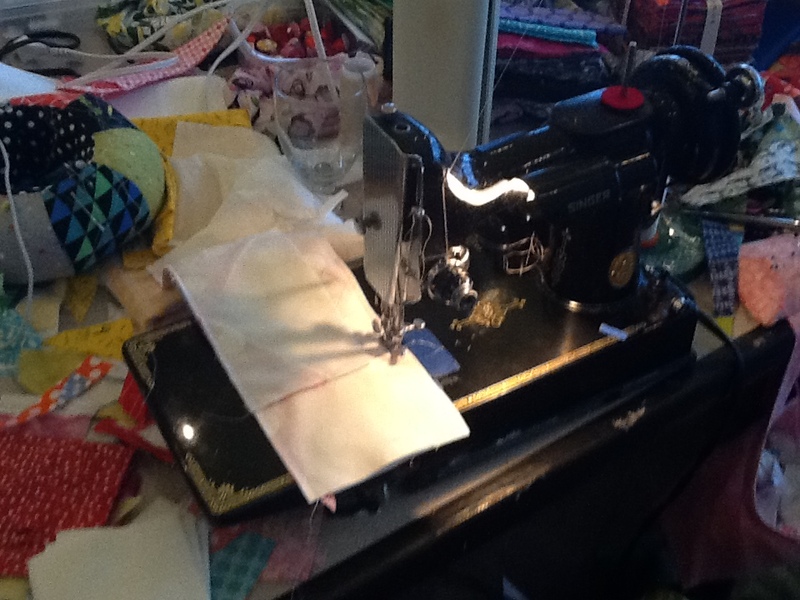 Most quilters are strippers at one time or another! 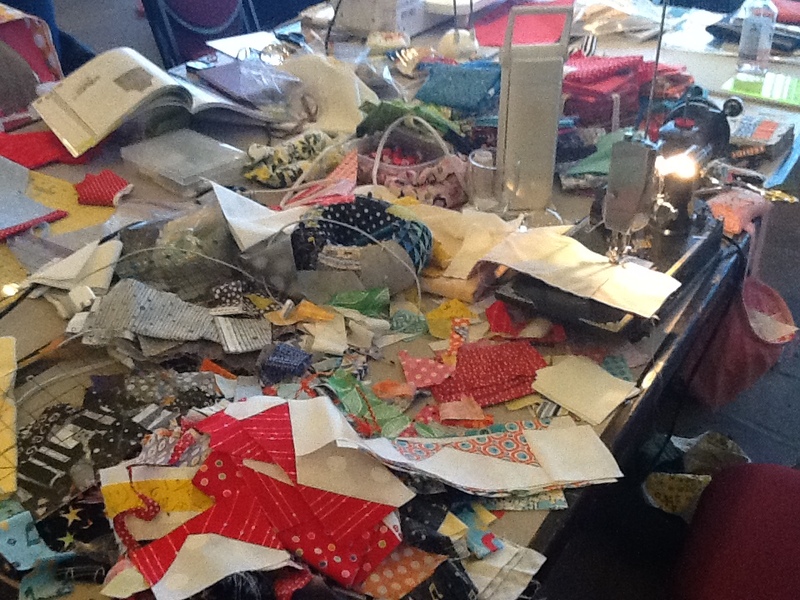 If you don’t sew, you would be surprised how long it takes to sew all these little pieces together. (And to make all the points and corners match). 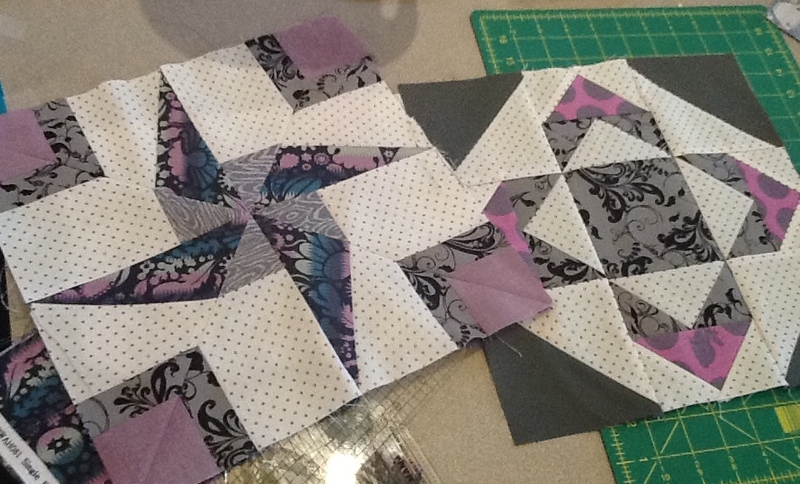 More wonderful piecing. We all worked very hard. Everyone does their own thing, so we get quite a variety. Wow! All those little pieces. Amazing what you can get done if someone else cooks for you! Striking! 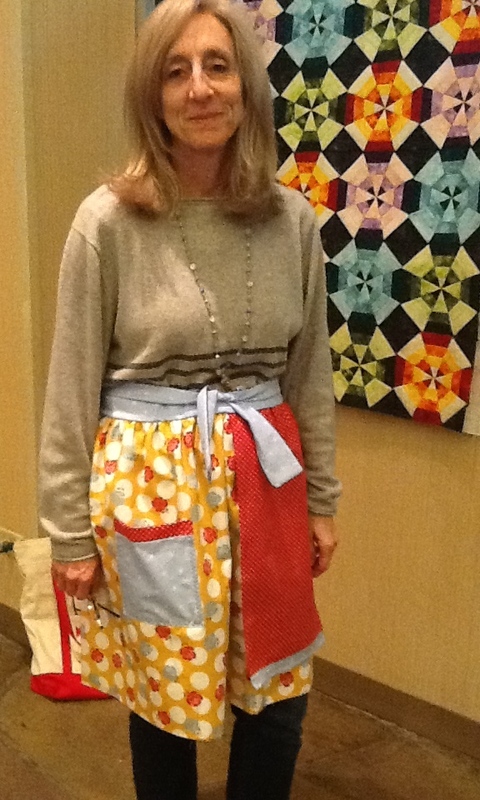 Bev ( my roomie) models her new apron. 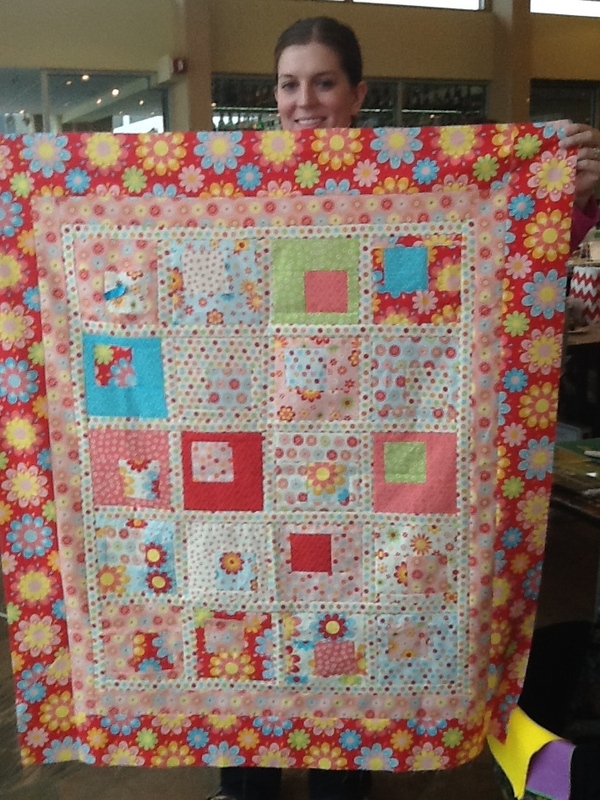 She also finished this small quilt. It just needs the binding around the edges. So what did I do for two whole days? Make a big mess, mostly! 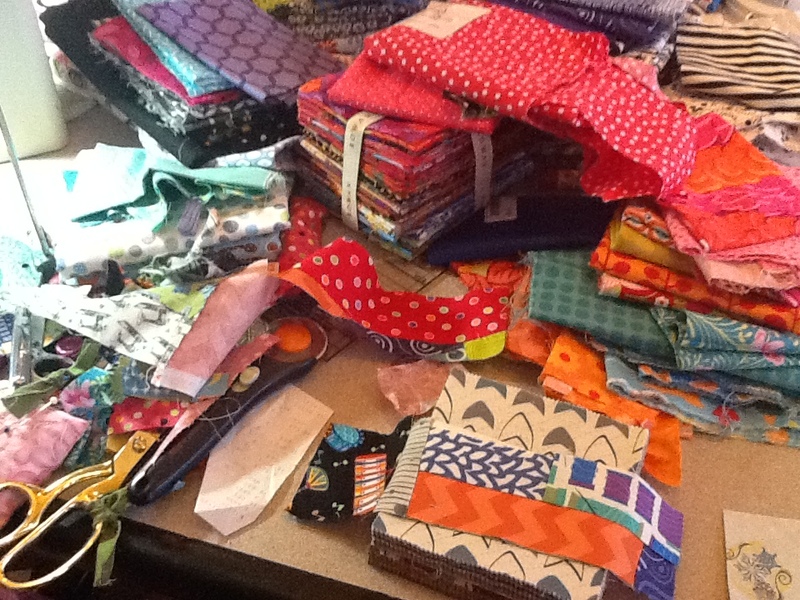 I brought a lot of bright, fun fabrics purchased just for the occasion. I did manage to finish 13 star blocks. Haven’t quite decided how I will put them together. I just design as I go. 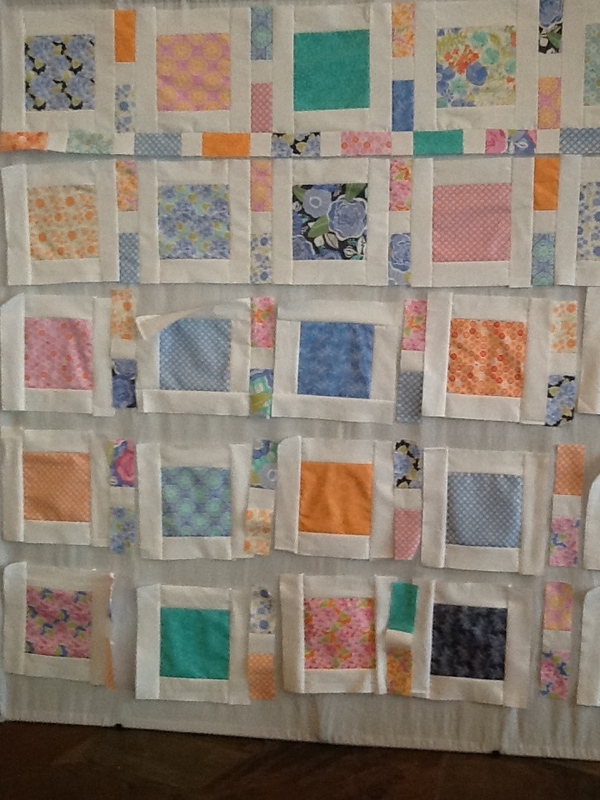 I put some borders on the 13th block. 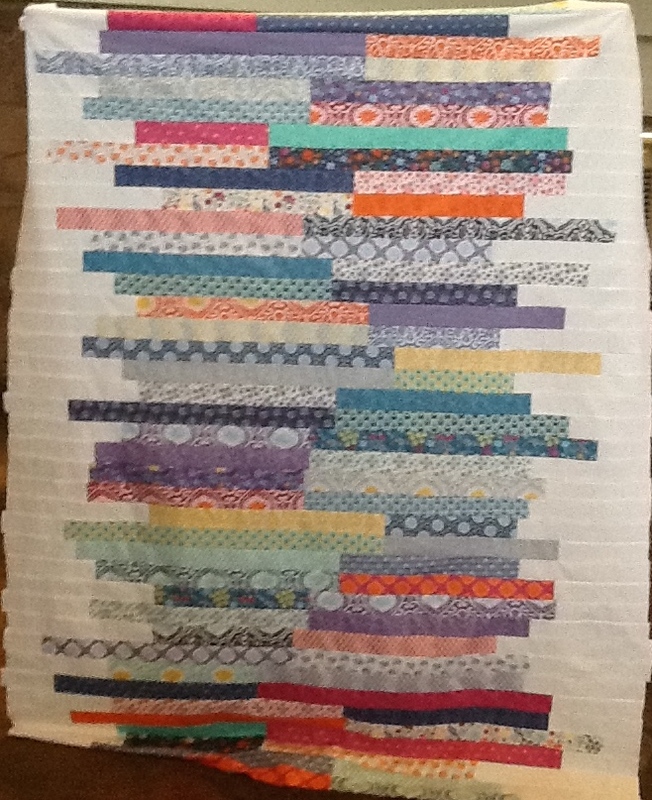 I think it will make a fun wallhanging when it is quilted. Well, that’s all folks. Hope you enjoyed the pics. 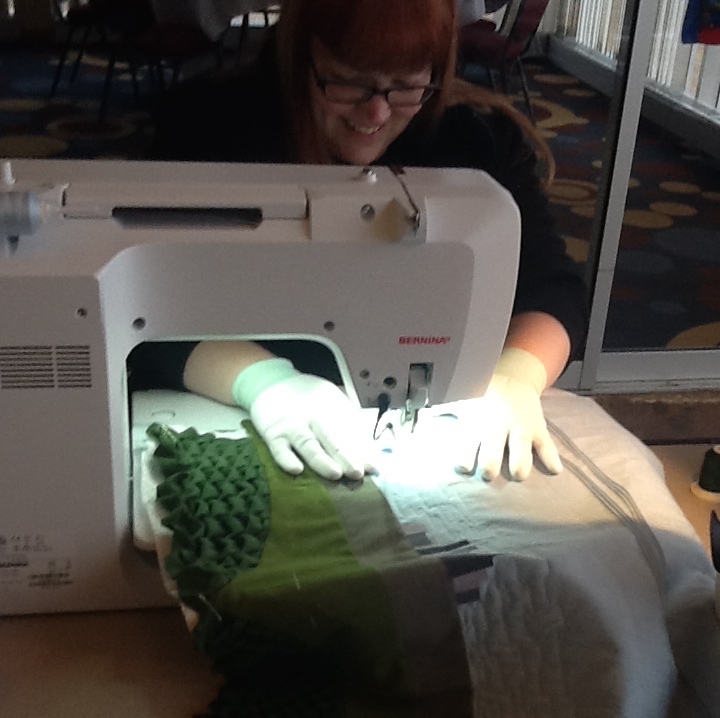 This entry was posted in Quilt Blocks, Uncategorized and tagged baby quilts, Illinois State Beach Resort, improvisational piecing, Pam Schoessow quilts, piecing, quilt blocks, quilt retreat, Quilt Retreat at Illinois State Beach Resort January 2015, quilt tops, quilters sew together, quilting, sewing, sewing at retreat, sewing by the lake, star blocks, strip piecing by pamelajeannestudio. Bookmark the permalink. Pam I love your improv stars. The next time I get a free afternoon I would like to make up some of those stars. 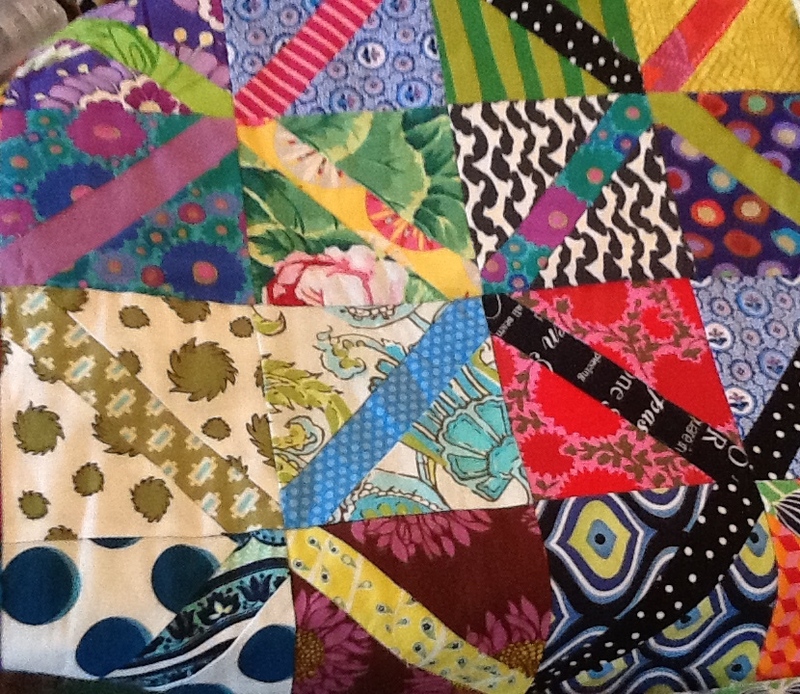 They would make fantastic charity quilts while using up scraps! 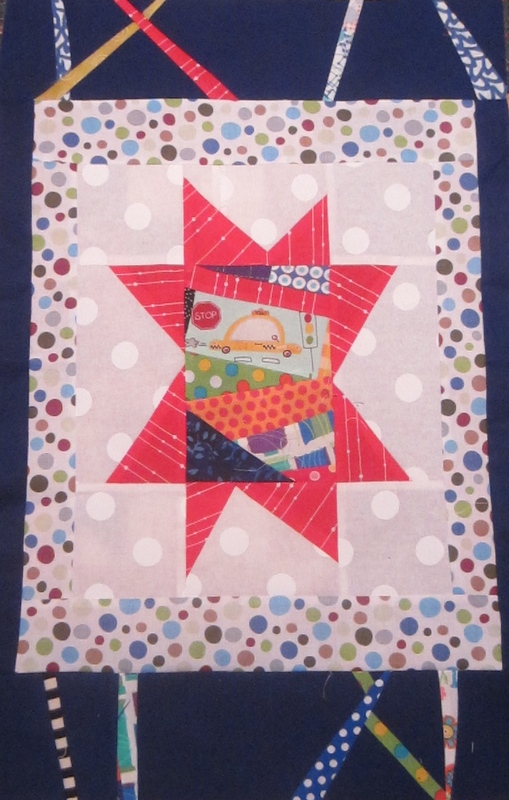 And fun to make too! Thanks for the inspiration. You’re welcome, Lucy. 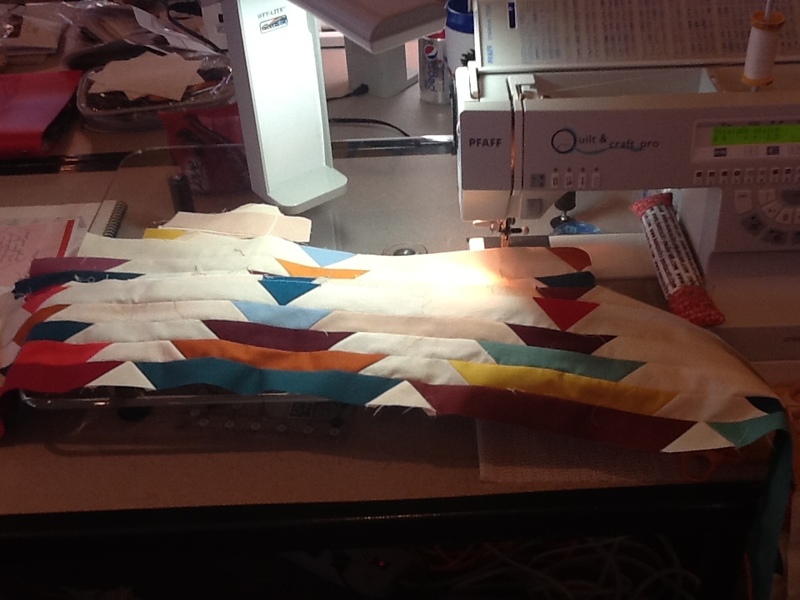 This kind of piecing is pure playtime. What a fabulous weekend! You were all so productive. 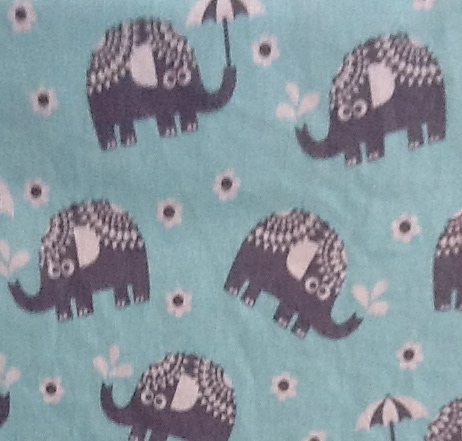 Love the elephants. 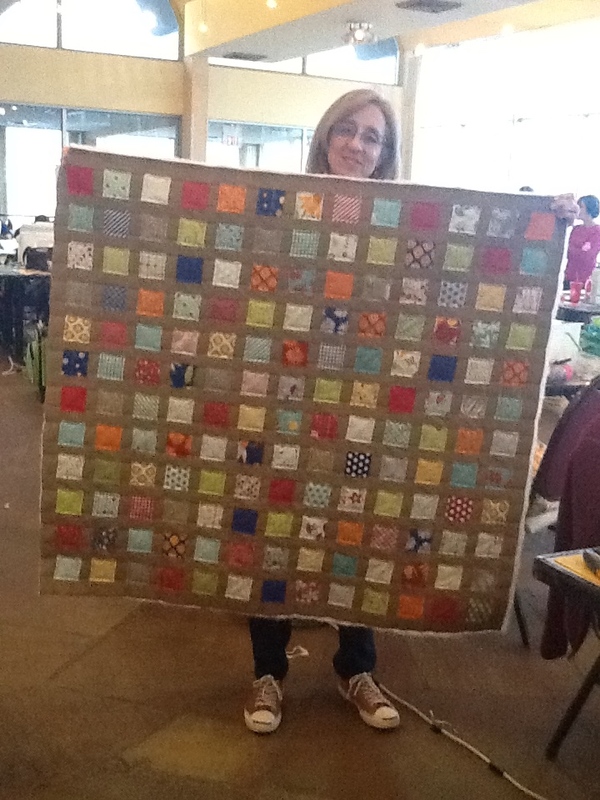 Yes, it was a a quilter’s dream. 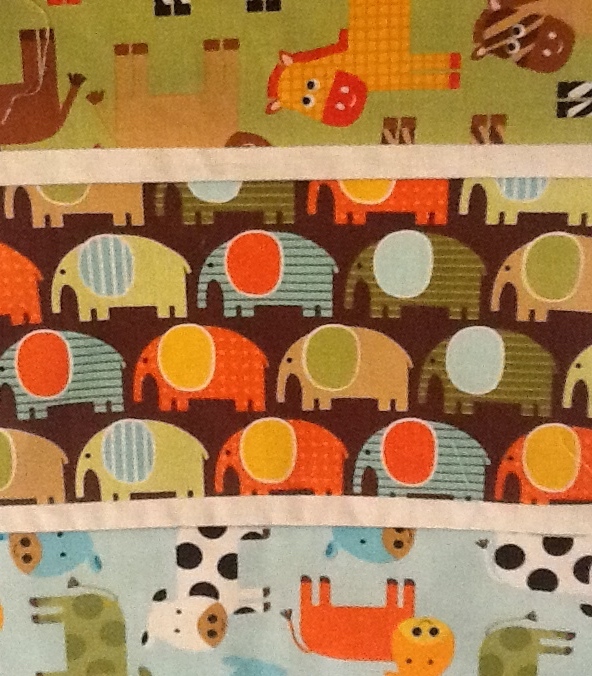 I saw a lot of great fabric and had to share. Pam, love you star blocks. It was so much fun sitting next to yo9u and watching your block evolve. Great pictures fun weekend. Until next year!!!! Thanks, Candy. 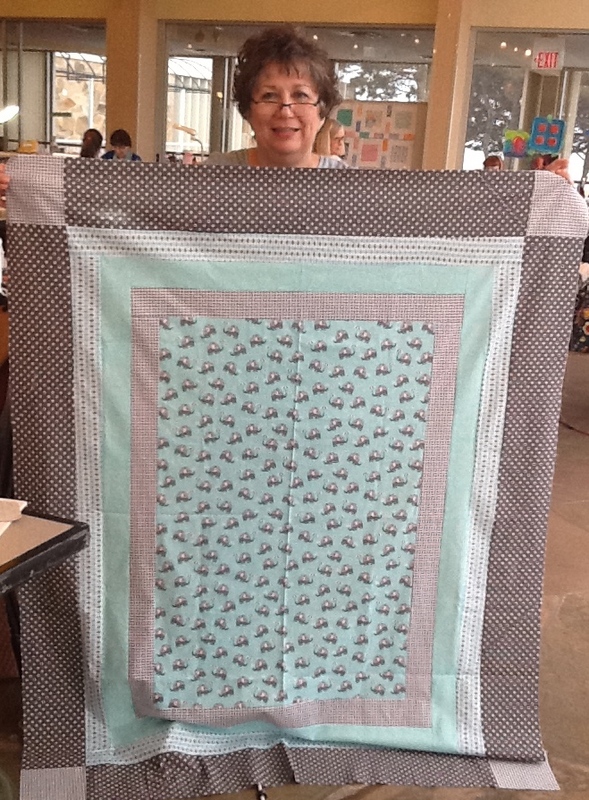 I really enjoyed seeing your quilt take shape. Me too! 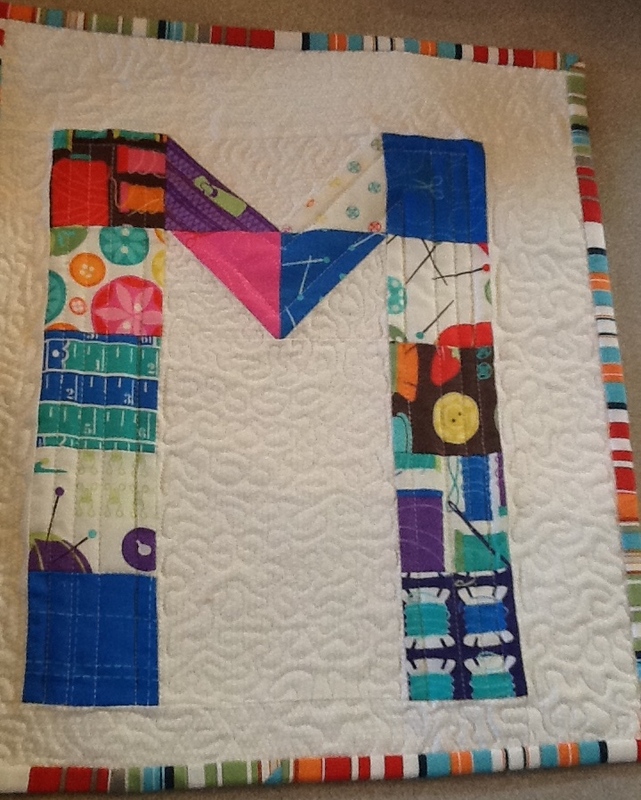 Unfortunately, I am much better at starting quilts than finishing them. I’m going to try to do better, so I hope I will have it completed soon. It’s hard to keep up with all my projects. Really enjoyed the pics. 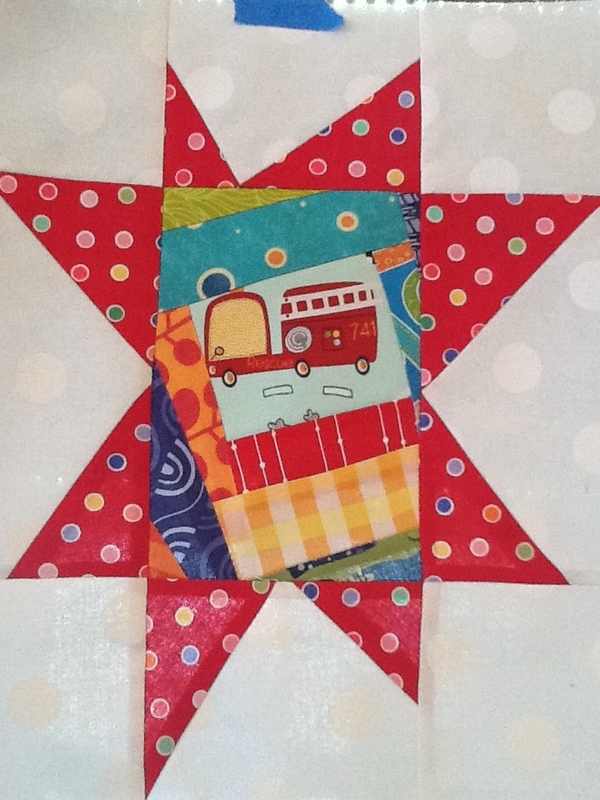 🙂 Your star blocks are fabulous! Thanks, Karin. 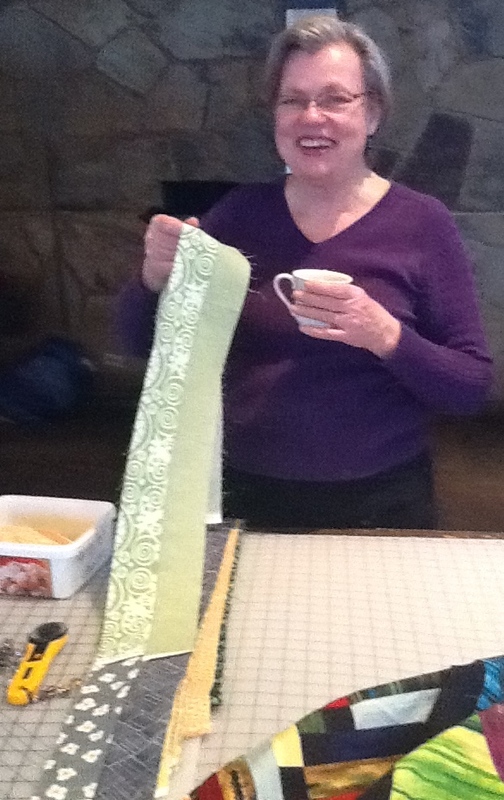 If you weren’t such a fabulous painter, I would suggest you take up quilting some time. I do enjoy it.